Pilots care a lot about crosswinds - the wind that's blowing across the path of your airplane. Wind blowing behind you is nice when you're cruising along, it helps you get there faster. Wind blowing straight at you is nice during takeoff and landing, because it's blowing across your wings giving you lots of lift while you're slowing down so you don't need as long a runway. But wind blowing from the side can be a pain, especially on takeoff or landing. You can't yaw into it, pointing the airplane a bit off center, because your wheels have to be straight when you land. So you roll into it, dipping one wing so a component of your lift pulls against the wind and you fly straight. You kinda land on one wheel. The more crosswind there is, the more correction you have to put in. But there's only so much you can do... there are limits, in the pilot operating handbook for every airplane, that say you just can't land or takeoff above X amount of crosswind. 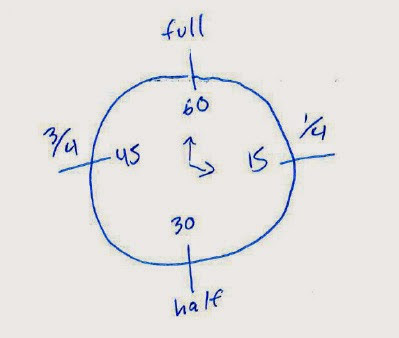 So when I took private lessons my instructor drew me this clock face to think about crosswind components. If I've got a 20 knot wind at heading 330 and the runway is 310, it's 20 degrees off, so between 15 and 30, so consider it closer to a quarter, or 25% - runways are always numbered according to the heading you're going to, to be nice, if you're looking at a giant number 31 your heading should be 31 and the wind should be 31... or close. it shouldn't be 18, anyway. oh back to the clock face. so a clock has points at 15 minutes, 30, 45, 60 minutes. 15 minutes is a quarter past. so 15 degrees of wind means a quarter of it will be crosswind. 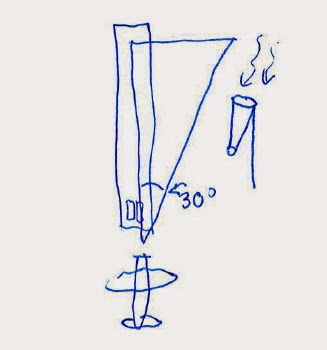 I was talking to somebody about this though, and told them that after two years of not flying, I could not remember how my instructor drew that clock face... not exactly. what was at the top, zero, so was 45 full, I asked another pilot if he'd seen that same illustration. and he said no... he just thinks about sines and cosines. 30 degree crosswind, you know the opposite angle is half the hypotenuse, you're flying into a triangle. So maybe it is easier to skip the cutesy tricks and just remember the geometry we all know and love. You can never go wrong with triangles. So, you now have ... similar ... minds about this? Cool. Yeah, the basic triangles are handy to remember. I still recall sin(30 deg)=0.5, sin(45 deg)=0.707, sin(60 deg)=0.866, and below 30 deg, I use 2% per deg as an approximation. I did a lot of mental engineering calculations when I was a TA.